To all the Watsons VIP Card holders, good news to all of you and to me too. In conjunction with Watsons VIP card's 7th anniversary, members can look forward to lots of goodies, exciting deals, promotions, offers, members only sales, carnivals in mall. joint promotion with leading brands, local and international artistes support and appearances from 5 September to 2 October 2017. Ms Caryn Loh, General Manager and Country Head of Watsons Malaysia said that it is a milestone since the launch of the Watsons Customer Loyalty Programme in 2010. The card was initially to reward their loyal customers through their very own loyalty programme offering exclusive deals and members only opportunities. At Watsons, they always value all their customers, their VIP members that have supported them at all times. If you want to catch up with the Watsons Syok Sale Carnival, book your calendar now. One Utama Shopping Centre's ground floor centre court from 6th to 10th September and at Sunway Velocity Mall's Vanity Atrium from 26th September to 1st October 2017. Expects great discounts and free giveaway of Watsons shopping vouchers and use a combination of cash and Watsons VIP points to purchase items at the carnival. There will be amazing line-up activities and entertainment which include celebrities meet and greet sessions, mascot appearances, Zumba dance performance, colouring contests, balloon giveaways, free health screening, cooking demonstrations and beauty workshops. TVB popular actresses, Sharon Chan and Elaine Yiu will also make their appearance during the Syok Sales Carnival at One Utama Shopping Centre on 10th September at 5 p.m.
Mr Danny Hoh, Customer Director of Watsons Malaysia said that Watsons team together with their Celebrity Friends had travelled on Grab car to the homes and offices of the selected VIP members and surprise them with Watsons hampers and points. During the anniversary for the month of September, Watsons VIP members could enjoy RM15 off for 2 rides with Grab by using promo code "GRABWATSONS". Valid for new Grab users and limited to the first 5,000 redemptions only. 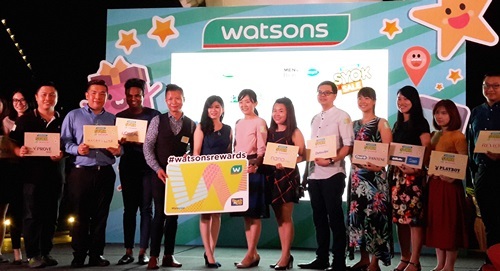 Watsons vouchers for redemption is also available on the Grab app, as well as a "Spot & Win" campaign. To win some prizes, all you have to do is to spot a Watsons wrapped Grab car, snap a photo of it and post it in Instagram. 10 most liked photos will win a total of 1 million Watsons VIP points. Happy Birthday to Watsons VIP Card. Being a loyal customer of Watsons Malaysia, the VIP Card has helped Mommmy Jane to save more and enjoy the discounts from several merchants. With the coming Syok Carnival, Mommy Jane will get more rewards from the card. If you haven't got the card yet, do get it now so that you could enjoy more benefit with their lifetime membership. Kak Su, this is the right time to enjoy great discount. Enjoy your VIP card ya. Shasha, faster get the replacement so that you can save more after this. Shamiera, congrats. Hope you will earn more to redeem more benefit later. Kak, memang untung. Can help us to save more and enjoy more benefit with the card. Seri, memang best. Hope to see you next round. Nasib i mmg vip card holder! Alia, congrats. Do utilise your card now to enjoy lots of discounts. Ruby, betul. Ha ha ha... But it looks special.